Sesamoiditis is inflammation of the bones beneath the big toe joint. This was the case with Lisa. She had been happily riding in the same version of a particular cycling shoe for years, and a change in shoe brought about symptoms of sesamoiditis. 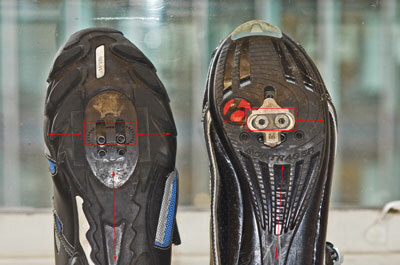 Evaluation of her new shoe revealed that the cleat was positioned too medial (toward the midline). Note the difference between her old shoe (on the left), and her new shoe (on the right). This combination of medial cleat placement and change in shoe last from straight to curved contributed to her painful symptoms of sesamoiditis. 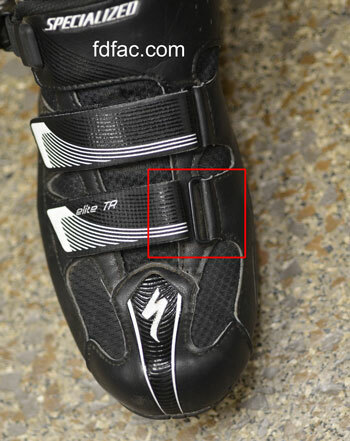 If you are a cyclist who has recently experienced injury, it would be beneficial for you to evaluate your cycling shoes and cleat placement. This is especially true if new symptoms arise soon after wearing new cycling shoes, or after increasing your training frequency, duration, or intensity. Sesamoiditis can be a challenging problem to resolve, so it’s important to seek immediate medical attention at the first sign of injury or symptoms. The physicians and surgeons at San Francisco’s Financial District Foot & Ankle Center are experts in treating sesamoiditis, and in treating lower extremity cycling injuries in general. If you have cycling pain, give us a call today at (415) 956-2884. 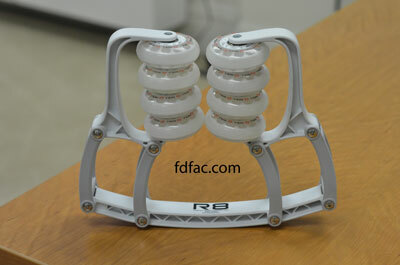 Ultra-runner Oliver, just brought in a new toy to show me – the R8 Massage Roller. The R8 is a cross between a vice grip, inline skate wheels and a foam roller, and it’s especially designed to alleviate lower extremity muscle tightness. 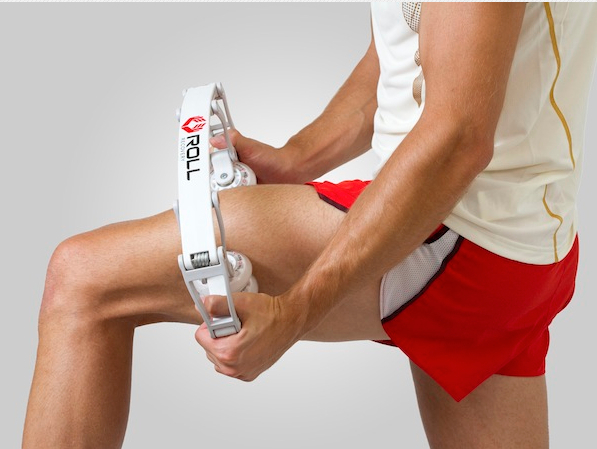 Oliver swears by its effectiveness, especially for his iliotibial band tightness. My only caution is to concentrate its use on the fleshy part of the muscle only and to steer clear of bone. Other than that, I like its versatility and ease of use. A patient came into the clinic today with a bad case of toenail fungus. She had seen three other physicians in New York for treatment recommendations prior to making an appointment with me in San Francisco. These recommendations included expensive medications, expensive creams and expensive laser treatments. In spite of the high costs, these treatments are sometimes worth it, depending upon the cause. In her case, though, the particular type of fungus was caused by the continuous use of toenail polish..
Fungus due to frequently polished toenails is called White Superficial Onychomycosis (WSO), and is easily cured with a simple, inexpensive emery board file. Similar to the mold that grows on the surface of cheese, this fungus is easily filed off, leaving the healthy nail below. Note that salon filing of nails is not rigorous enough to remove this type of surface fungus, so take matters into your own hands and file away WSO before you go in for a pedicure or polish change. This will keep the fungus from getting worse or spreading. It may also save you hundreds of dollars in treatments. Sesamoiditis is a common condition where one of the two bones underneath the big toe become inflamed, injured or fractured. This most commonly occurs when there is repeated, constant pressure or force applied to the sesamoids or during a one-time time traumatic event. 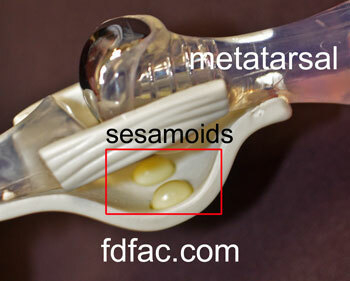 This image shows the anatomy of the sesamoids as they relate to the big toe joint. 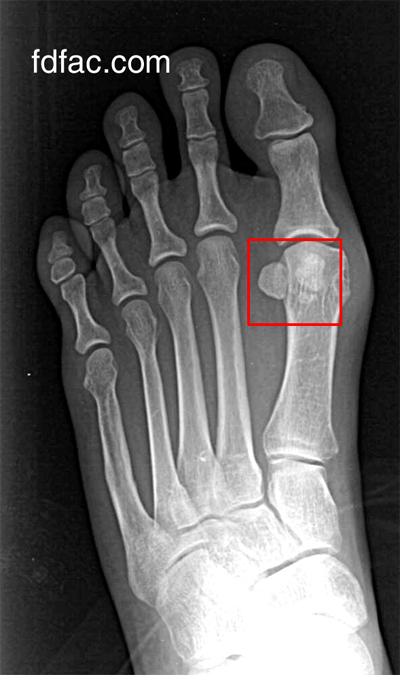 This image is of a weight-bearing x-ray, showing an intact sesamoid next to a fractured sesamoid. I have treated many cases of sesamoiditis and fracture that happened during spin classes. Typically, this happens when the pedal rests squarely below the forefoot or when the majority of the class is spent out of the saddle. You may need an MRI to confirm that the fracture is healed before going back, and you will definitely need to modify your cycling form. Less standing and less resistance when you do stand will give your quads more of a workout, and will also reduce the force going through the sesamoids. 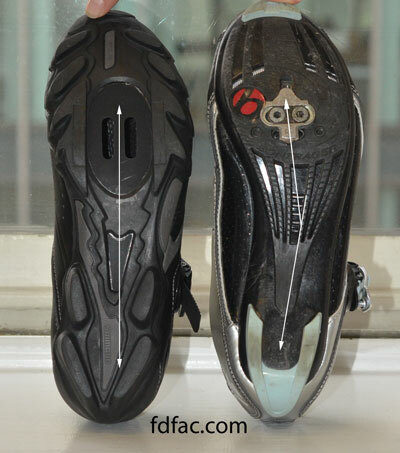 Clipless cycling shoes are notoriously tight. This is great for fit, and not so great if you have a wide forefoot or bunions. 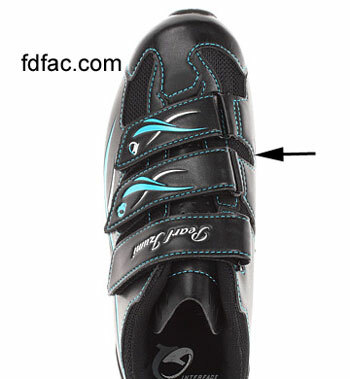 If you are a cyclist and suffer from bunions or have a wide forefoot, the following shoe-fitting recommendations should help. 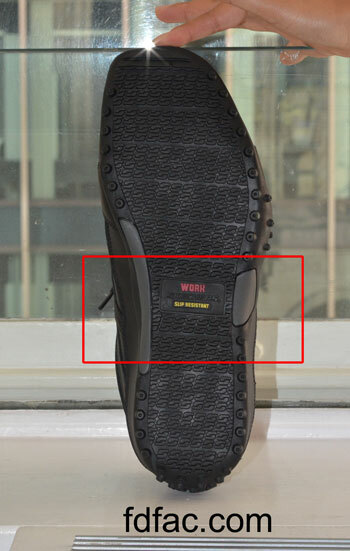 If possible, try and find shoes that don’t have a strap that tightens over the bump as seen above. Ideally, you will want to wear shoes that have either 3 straps or an offset strap away from the bump as this image shows. If you already have a shoe that secures and tightens directly over the bump, simply undo the strap and avoid using it entirely as the following image shows. If you need a non-slip shoe for restaurant or housekeeping work and you have a narrow foot, your choices are very limited. Fortunately, Skechers makes a non-slip lace shoe for men that — even though sized medium — runs narrow. The style is called Rockland-Systemic and can be purchased from Zappos.com. 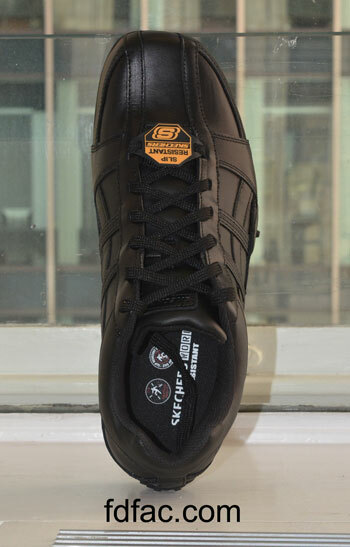 First and foremost, this shoe is great because it laces (as opposed to being a slip-on style), which is always better for the narrow foot. Also terrific is the fact that there are 6 sets of eyelets: the more eyelets there are, the better the shoe fit, especially for a narrow foot. Finally, there is no hourglass in the waist of the shoe, which provides support in the arch where needed most. This also makes for a stable foundation if orthotics are to be worn inside the shoe. Hiking boots are designed to resist side-to-side motion. This is typically accomplished by using a stiff upper and reinforcing the shoe both laterally and medially. Although this is great for support, it can make the shoe feel like a vice grip for those hikers having bunions or needing extra forefoot width. If you have bunions, then you will want to make sure your shoe doesn’t have additional trim over the bony prominence. Hiker with Tailor’s Bunion with hiking boot trim removed over painful area. If it does, then removing the trim can mean the difference between comfort and pain. The following image is a hiker having a Tailor’s bunion. 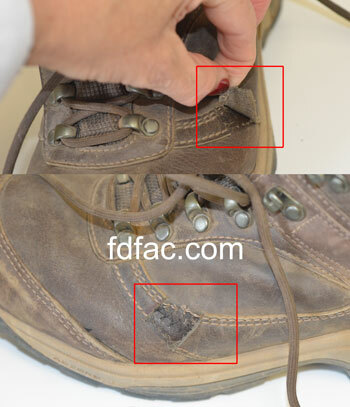 As the image above shows, it was easy to remove the trim, making the boot more forgiving in those otherwise tight areas. You can also modify the lacing as the last tutorial in the following video shows.